Let's Give Hope to Visually Impaired Students in the Philippines! Please help us support the Philippines National School for the Blind. Hello everyone! 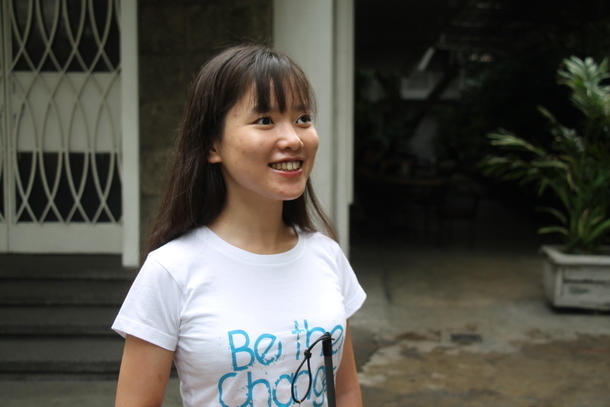 My name is Yukari Ishida and I’m working for Free The Children Japan and in charge of Education for the Visually Impaired Project in the Philippines. 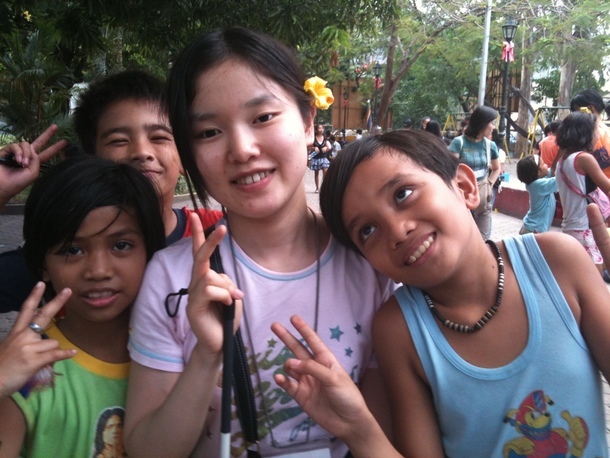 When I was a university student I participated in a study tour to the Philippines with Free The Children Japan. As a result, I came to realize that many visually impaired children were incapable of receiving a proper education there. The reality of the situation came as a great shock to me. Being completely blind myself, I know firsthand the importance of being properly educated in a s school for the blind. I think that all visually impaired children have the right to receive the same education. In order to ensure that they are able to become independent and self sufficient, a specialized education is crucial for visually impaired children. 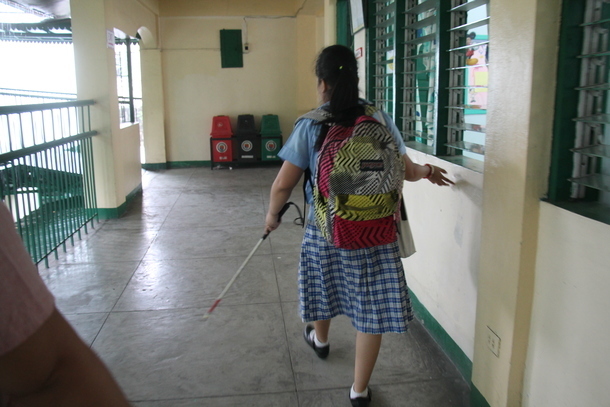 Unfortunately, there are only two schools designated for the visually impaired in the Philippines. In order to help visually impaired students in the Philippines continue to receive a proper education, Free The Children Japan is aiming to raise money to go towards fixing the roof of the school’s dormitory and to purchase a new school bus. I have been completely blind ever since I was one year and three months old. I received education at a school for the blind all the way up until I graduated from high school. As one would expect, we were taught how to read and write brail in addition to studying the core subjects such as math and so on. More importantly, we were taught how to use white canes, or walking sticks, in order to navigate the outside world on our own. We were taught specific methods to full a cup just right, use sharp objects, to go shopping, to make sure we didn’t put our clothes on backwards. Cooking, cleaning, sports; you name it, we learned how to do it. For someone with a disability, visual or otherwise, school is not just a place where you go to study the usual subjects. Rather, it is a place where you go to learn crucial, everyday skills. In other words, it’s where you learn how to live a normal life despite your handicap. Most parents are understandably filled with uncertainty upon learning that their child suffers from a disability. How will we raise them properly? How will we educate them properly? So heavy is the burden for some parents that they completely lose hope, thinking that there is no method, no future for their child. It is for these reasons that children with disabilities must have the option to attend a specialized school with trained professionals who can teach them, guide them in order to ensure their future success in society. The average rate of enrollment for primary education in the Philippines has recently reached 96% nationwide. In stark contrast only 5% of visually impaired children are enrolled in school. What’s more concerning, according to WHO (World Health Organization), developing countries have reported disabled individuals make up an average of 15% of their respective populations. The official count in the Philippines is merely 1.57%. That’s 1,443 people in country of more than 90 million. Given that number, it can be inferred that parents of disabled children are choosing not to make their birth records public, in essence hiding their existence from society. Among those living with disabilities in the Philippines, individuals who use wheelchairs and the visually impaired are the most likely to be kept out of the public eye. According to a recent study, only 48% attend school or receive assistance from a church or support group within the Manila metropolitan area. That number drops to under 20% in rural areas. Those who are fortunate enough to attend school or go to work on a daily basis are burdened with long commutes. Those receiving assistance from churches or support groups rarely leave their homes, going out an average of four times a month or less. For everyone else, the opportunity to go out is nearly non existent. Something must be done to reach out to disabled children of preschool age and ensure that they are given the same opportunities to learn and interact within society as anyone else. Unfortunately, it has proven difficult for support groups to get an accurate number or even a location for a majority of these children, making progress extremely difficult. Learing about these situation around visually impaird children in the Philippines, I wanted to do something. And I began working with an NGO in Japan because I want to help change the current situation in the Philippines. I want to be able to support disable children who have a desire to learn. I want them to grow up and realize their full potential. In Japan alone there are more than 70 schools designated for the visually impaired. In the Philippines there are only two. 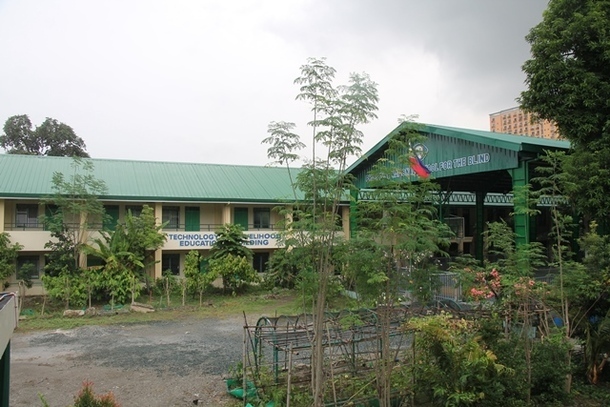 Of the two, only one school, the Philippine National School for the blind provides the newly mandated 11th and 12th grade education. Although some visually impaired students do attend regular, local schools, these schools are not properly prepared or staffed to give these students the special assistance that they require. Because of this, it is not a rare occurrence that these students attend class without assistance and are left to manage on their own. To make matters worse, the possibility of receiving assistance drops significantly once they reach middle school. Along with this problem, some children have to travel long distances to attend school which makes getting a basic education extremely difficult. Being the only school in the nation to offer visually impaired students upper level education, the Philippines National School for the Blind understandably has a long list of applicants hoping to attend. Currently 96 students are using the schools dormitory which, at 46 years old, is crowded and because of the poor condition of its roof, temperatures inside reach 35 degrees Celsius or higher on a regular basis. The school has been making great efforts to educate the people of the Philippines on the capability of those born with visual handicaps by holding regular scheduled events and seminars. By doing this, the public is slowly starting to change their opinions on the visually impaired and their worth to society. In order to get to these events and seminars, students rely on a 20 year old school bus which is rather aged, having holes in both its roof and flooring. Gradually, the safety of the students riding the bus has become more of a concern. However, the school is not left with many options. Cars older than 10 years in the Philippines are not deemed worthy of purchasing, so even with proper repairs, the bus couldn’t be sold for profit to go towards a new one. In order to help visually impaired students in the Philippines continue to receive a proper education, Free The Children Japan is aiming to raise money to go towards fixing the roof of the school’s dormitory and to purchase a new school bus. By fixing the roof of the dormitory, students from around the area can be assured having comfortable living conditions while continuing their educations and job training. 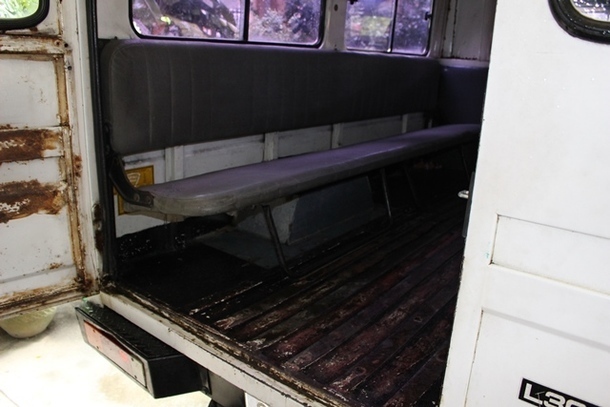 By purchasing a new school bus, the students safety can be assured as they go out to further educate the people of the Philippines about their capability and worth to their society. Together we can guarantee that visually impaired students from all over the Philippines are able to complete their education, receive job and skill training, attend university, and realize their full potential. Furthermore, we can help the on going support of students already in enrolled in the hopes that they too can continue their education. In order to do two things with PNSB, we need to raise 8,000,000yen (70,000USD) and we really appreciate if you could support us here! As someone who was born with a disability in Japan, I always thought that going to school was just a normal part of life despite of it. Starting from kindergarten, I attended schools for the visually impaired, graduated from high school, university, and was even fortunate enough to study in the UK for graduate school. It never occurred to me that someone with the same disability living in another country would not be able to receive an education or even leave the house for that matter. I was not aware the blind people, just like me, were though of as a burden on their societies. The fact that I was born and raised in Japan does not make me an different from a blind person living in the Philippines. We are equally capable human beings despite our nationality. We are not able to choose what country we are born in. Likewise, we are not able to choose whether or not we are born with a disability. Everyone wants to live their life to the fullest; disabled people are on different. No matter where you were born, whether you have a disability or not, we all have important things we want to accomplish in life. We want to learn, we want to grow, we want to live in a society in which we know that we are welcomed and are able to contribute in a positive way. Even if its small, together with Free The Children Japan, and as the leader of this project, it is my dream to make this a world without segregation. I beleive together we can and we need your help. So, please help us to make it happen. Thank you for accessing our project page.